Baking Bread is integral to celebrating Lammas. If you've never tried before heres a how to from Cooking School at Fabulous Foods to help you on your way. Bread. One of our biggest staples. How often we take this wonderful food for granted. In today's hectic world, most people get their bread from the grocery store or possibly a bakery. It isn't difficult to make your own bread at home, however. A little time and patience will do the trick, along with some good instructions, which we'll provide. No time or patience? You can still have wonderful home made bread, thanks to the incredible bread baking machines on the market. These machines are (pardon the pun) the greatest thing since sliced bread. You simply pour in a few ingredients, turn them on, and in a few hours your kitchen will be filled with the wonderful aroma of home baked bread. You can even set a timer to wake up in the morning to freshly baked bread. For the purposes of this article, however, we will assume you are not using a bread machine and are going to do the entire process by hand. Well, maybe not entirely by hand. A food processor or a heavy duty electric mixer with a dough hook will help tremendously. If you don't have either of these kitchen machines, you can make bread by hand, but be prepared for a good work-out. The dough will need a lot of kneading and mixing. Contrary to making cake or pie doughs, breads generally get better the more they are kneaded and handled. If you're mixing bread by hand, get a very heavy duty wooden spoon and use your muscles. The basic ingredients in bread are simple and few: flour, liquid, yeast, sugar and salt. 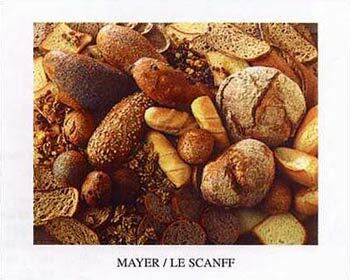 Each has a very specific purpose and your bread will not work out if any of them are eliminated. Fats are the one occasional exception to this rule, but more about that later. There are, of course, optional ingredients which can add character and flavors to home baked bread. Flour - Wheat flour contains a substance known as gluten. When gluten is mixed with a liquid, then kneaded, it stretches to form an elastic network which traps the gas bubbles formed by the yeast in bread. Different types of flour contain varying amounts of gluten. Many special grains such as rye, corn meal or buckwheat often need to be combined with regular wheat flour because they don't contain enough gluten for proper bread structure. If you're following a bread recipe, you won't have to worry about all this technical stuff. Yeast - Yeast is the most typical leavening ingredient used for breads. It is a living plant, which grows in warm moist doughs, causing those doughs to rise. Yeast comes in two forms, active dry yeast, and compressed yeast. Home bakers will almost always be using dry yeast. Store dry yeast in your refrigerator for longer life. Active-dry yeast will be activated when mixed in warm water (95-115°F). If the water is too cold or too hot the yeast will not activate. If you don't have a thermometer, you can do this step "by feel". The water will feel very warm, almost hot, to the touch. Rapid-rise yeast (also known as quick yeast) cuts the dough rising time in half, but the recipe does lose some flavor in the process. I don't recommend using rapid rise yeast unless a recipe specifically calls for it. Liquids - The type of liquid used will affect the final bread loaf. Breads made with water generally have crisper, thicker crusts, such as baguettes or French Bread. Those made with milk have softer crusts. Sugars - Sugars stimulate yeast growth. Granulated sugar, brown sugar, honey or even molasses can be used depending on your recipe. Fats - Fats such as butter, oil or shortening help give bread flavor as well as help with texture. This is the one ingredient that can be left out of some bread recipes without compromising the final product. Some French breads and baguettes have no fat. However, if you are making a bread without fats, plan on eating it right away as it will quickly turn hard as a rock if stored. Salt - Salt is necessary not only for flavor but also to help the yeast grow more slowly. This results in bread with better texture. Eggs - Not all breads contain eggs, but those that do are generally very tender and have a rich golden color. Add Ins - Nuts, fruits, even candies can be added into your bread doughs. Just be aware that these add-ins will slow the rising time. 1. Place very warm liquid (see yeast above) in bowl and sprinkle yeast over the water. Let stand for about 3-5 minutes until yeast dissolves. 2. Gradually mix in sugars, fats, salt and flour. If using a food processor, it is best to add these while machine is slowly running. If using an electric mixer. add these ingredients in several additions. Gather your dough into a ball. Using the heel of your hands, press down on the dough. Pull up the part of the dough that was flattened by your hands and fold it back over on itself. Keep repeating the process, turning the dough periodically. Your dough is properly kneaded when it is very smooth and elastic (about 10-15 minutes by hand). 4. Place your kneaded dough into a greased or oiled bowl. Cover the bowl with a clean kitchen towel and set in a warm, draft free place to rise. Allow the dough to rise until it is doubled in size (photo of the dough after it rises is coming soon). This will usually take between 1-2 hours depending on the type of bread you are making. 5. Test the dough. Your dough has risen enough when you can press two fingertips lightly into the dough and have the indentation remain. 6. Punch down the dough. After the bread has risen, push your fist into the center of the dough. Pull the edges toward the center, turn the dough out onto a lightly floured surface and knead a few times in order to remove all the air bubbles. 7. Shape the bread. Take the dough and shape it in the manner you desire. If you're making rustic loaves, divide the dough into the amount of loaves you wish and shape them on a well greased baking sheet. Ditto rolls. If you're using baking pans, make sure they are well greased, then shape the dough into the loaf pans. Once your loaves are shaped, cover them, once again, with a clean kitchen towel and put them back in the warm, draft-free place to rise until doubled again. Note: Dough will rise more quickly each successive time it is punched down. 8. Glaze the bread (optional). Some bread recipes will call for a "glaze" or "wash", which gives the finished bread a special finish. Glazes included beaten eggs (either whole or just whites or yolks), water, cream or milk. Your recipe will specify if a glaze is necessary. 8. Pre-heat the oven. Bake the bread the amount of time specified in your recipe. When baked, remove pans to a wire cooling rack. 1. What if it doesn't rise? Your liquid was most likely either too hot or too cold and you've killed the yeast. Don't despair, this bread can still be saved! Dissolve 1 tablespoon yeast and 1 teaspoon of sugar in 1/2 cup very warm water (110°F). Mix in 1/2 cup all purpose flour. Let this mixture stand in a warm place for about 10 minutes. It will turn foamy and spongy. Beat this mixture into your un-risen dough then knead in enough flour to correct the consistency. Cover this dough and place it back in a warm place to rise. Proceed as normal. 2. What if my bread rises too much? Simply punch it down, re-shape it and let rise until doubled. 3. How often can I punch the dough down? Twice is optimal, but you can do it more often in order to correct dough that has over risen (see above). You do want to try to punch the dough down as soon as it has risen in order to have bread with a fine texture. Bread that has over-risen will be coarse. 4. What if I don't have time to finish the bread? No problem. Let the dough rise once, then punch it down, place it in a plastic grocery bag and refrigerate it (you can even freeze it). When you're ready to continue, remove the dough from the cold, let rise and continue. Now why don't YOU give it a try? Here's an easy recipe to start with! Add egg, butter, 2-1/2 cups warm water, salt and sugar and mix together. Knead 4 minutes on the dough hook. If you don't have a machine with a dough hook, mix in the bowl for about 5 - 7 minutes with a wooden spoon. Remove from bowl and knead 10 minutes by hand. Let rise 1 - 1-1/2 hours until doubled. Bake at 400o for 15 minutes then turn down heat and bake at 375o for another 25 minutes.